Of the parents What are the odds your parents will be okay with you walking the streets of Dhaka wearing a costume going door to door in search of candy? None. They'd rather buy the candy to placate you, entirely missing the whole point of the tradition. It's like offering you pudding on your birthday instead of cake. They both taste great, but it's a birthday! Of the doors So you cover your face with a Spiderman mask, walk up to a Bangladeshi's door, and expect them to open it when you yell, “Trick-or-treat!” Yeah. That could lead to many things, one of which being your arrest. If they don't call the police, you're in for aching feet as the residents wait to see if you leave on your own. A persistent trick-or-treater, however, may be rewarded with a Mr. Mango or Chloromint slid under the door. On the other hand, an irritated granny with a cane could open the door instead and, upon discovering an ugly red and blue 'monster' standing before her, whack said 'monster' around until someone, if anyone, comes to the rescue. If you're lucky, you'll be deemed innocent. If, however, your rescuer takes the old woman's side, you're in for a gonodholai, chances of which you escaping alive are slim. Another possible outcome is a pretty girl peeking through a crack in the door. Don't consider yourself lucky just yet. If she's at home on a holiday night, so is her dad. In case you're still waiting for her to return with candy, thinking of a way to chat her up, feel free to consider yourself already dead. She will not come back. Her father will, though, along with his licensed rifle. Wearing a mask on his doorstep talking to his daughter? You must be the boyfriend. And it's never her fault. Of the streets You have a bag in your hand. Beggars can smell all kinds of bags. But you've dealt with beggars all your life; you live in Dhaka city! This group is a little different from the usual throng though. They're less interested in your goodie-bag than in your outfit. They pull at your cape, the mask, wonder at the outer innerwear and are generally dangerous and disturbing beings, especially since the groping hands belong to humans of all ages and sizes. You will end up giving up the bag to the children, a part of your costume to the rest of the crowd, and running away. Now, Bangladeshi street dogs have seen many strange things in their lives. An eleven-year-old beating up a group of muggers. Two guys trying to kill each other for no apparent reason save one was wearing a blue-and-white shirt and the other yellow-and-green. Crow poop in rainbow colours. What they have never witnessed is a large furry beast racing through streets, which essentially belong to them. Hence they will protect their territory, aka chase you, eager for the meat on your just-out-of-reach legs. Getting away from the dogs will be no easy task, but you've done it before (you're a Dhaka native), and you could do it again, if missing a pound of flesh or two. You've also learned to suspect every nice-looking guy who's been following you for the last ten minutes, so you shouldn't be surprised if he suddenly pulls out a weapon and demands you hand over your candy. You could run, although that won't be the best idea if it's a gun he holds, or you could pretend you're the aforementioned eleven-year-old karate black-belt or the Man of Steel, and fight for your candy. But if you're unwilling to break an arm and are just feeling smarter than usual, you could merely do as told. Maybe you got a couple liquorice beans from a random house. That'll teach him to take candy from kids. There's a high possibility you'll be spending the rest of the night in one of those endangered Dhaka trees, away from the muggers and beggars and rabid dogs and crazed dads with guns. Of Old Dhaka Old Dhaka people follow traditions quite strictly, so every household there, if not anywhere else, will definitely put out a carved pumpkin with a burning candle inside, including the chemical warehouse owners. Fatalities in the inevitable fire or not, there's a gonodholai somewhere in there? Can't you feel it? 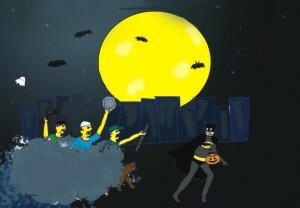 Of Dhaka University Just like the World Cup brings out two factions in the country, Halloween brings out four, namely Batman fans against Superman fans. The fights are countrywide, and the next day newspaper headlines are riddled with reports of injuries. What happened, you ask? There will always be a poor, ignorant fool who's going to loudly declare “Zombies!” in the middle of a heated argument over the worth of werewolves against that of vampires. And you thought it was only a religious thing.